D-20 4BR/4.5BA ,with quality linens & towels. Pet friendly and FREE WIFI! Townhouse D-20 4th level:Open concept living room/ kitchen/dining on the top floor with a screened in porch. 3rd level: King Master BR/BA wth oversized walk in shower and granite vanity dual sinks attached balcony. Queen BR/BA with shower and bay window. 2nd level: Queen BR/BA with balcony. 2 Twins with trundles , bay window and attached bath. 1st floor laundry area and a new screened in cabana directly across from the pool. The cabana features a picnic table and ceiling fans. A new Genisis Weber grill is next to the cabana.There is a private elevator to each floor. The kitchen is well set up with waffle iron, blender, slo cooker, toaster, coffeemaker. Dishes for 12 and non breakable dishes for eating alfresco on the screen porch or cabana. WiFi in all rooms, 32" flatscreen tv in the MBR and 55" flatscreen in the living room . The view from every room is breathtaking. Pet blankets, towels and dishes in the laundry room. Dog will require Owner's approval and guests are compleatly responsible for any issues concerning their dog. We encourage you to enjoy the kayaks, but PLEASE BRING YOUR OWN LIFE JACKETS! We have beach chairs, beach towels, and a beach cart for your use. This is a completely NONSMOKING home. There is NO SMOKING anywhere on the property. If evidence of smoking is found the total damage deposit will be forfeited. We have recently upgraded all the kitchen appliances and will be doing additional upgrades in January 2017. Guest must contact ownerdetails prior to being approved!! We bought this property to use as our winter home when we retire. We hope to escape the Midwest winters and enjoy the relaxed lifestyle of the beautiful Cape San Blas area . 100 steps to the beach and a gulf view from every window! Gulf view from every window! A beautiful view from every room. 10 -12 gourmet spices ready for use . Paper towels, dish soap, hand soap, dishwasher detergent, clothes washer detergent are on site for your use.. Custom made dining room table that will seat eight. Four bar stools are located in the same room at the oversized counter. 55" screen in the living room and 32" in the king ,and both of the queen bedrooms. There is a portable stereo that can be taken out to the deck. One balcony is located off of the master bedroom, one off of the queen and the fourth floor balcony is off of the kitchen is screened. All three balcony's are fully furnished. Two kayaks with paddles are available. Life jackets are not provided. There are two decks, plus a screened in porch on the 4 th floor off the kitchen and a screened in cabana on the ground level with a grill, picnic table ,& outdoor shower just 25 steps from the pool! Cape San Blas is an are of incredible beauty beauty which is still very rural. We enjoy horseback riding and bonfires on our beach with beautiful Gulf views.. we are adjacent to St Joseph Peninsula State Park which has wonderful trails for hiking and biking. The dunes on the Cape are protected for nesting sea turtles. Ecotourism is what we are all about! Even though Hurricane Michael pushed us off Cape San Blas way too soon, we had a great two days. The condo was very nice, clean and the location and view were beautiful. We only had one full day on the beach, but we enjoyed every minute. Mary Mardan, the owner of the condo, was very nice and easy to work with. We will definately consider this location and condo again on our next beach vacation. Thank you so much for you great review . We all regret Hurricane Micheal’s visit that cut short your beach vacation and damaged our beach home. You should know that I arrived about a week ago and I’M ON IT! We hope to be operational by Feb1, 2019 and expect to love our new exterior and interior finishes even more. See you in 2019 for our best year ever! Our family enjoyed our week at The Sanctuary on Cape San Blas. The elevator was helpful for moving all of our belongings in and out. The beds were comfortable and we loved having a bathroom connected with each bedroom. Mary, the owner, checked with us every day by text messages to make sure our stay was comfortable. Every problem was taken care of quickly. Our only complaint was about the water pressure on the top floor, and I'm sure that Mary will take care of the issue as soon as possible. It was handy to be able to leave all of our beach things in the cabana. The pool is very close and there was only a short walk to the beach. We liked everything about the beautiful Cape San Blas beach. We rented beach chairs and umbrellas for the week and they were there for us to use all day and late into the evenings for our fires on the beach. We recommend staying at The Sanctuary. Thank you so much Mona for such a nice review. I’m very sorry about the water pressure issues due to our local utility company mechanical problems. We are cleaning out all our faucets and draining out our water heater to see if that helps . We were able to get a plumber in an have ordered a booster pump that will be installed this week. You were wonderful guests to host in our winter home . We would look forward to to hosting you again on you next beach vacation at The Sanctuary At Seacliffs. This is our third year vacationing on the Cape and it was wonderful. We are the type of family that likes to cook and eat so we can spend as much time as possible on the beach. The Sanctuary has a well stocked kitchen and a wonderful screened in porch to eat on and enjoy the view and the sound of the waves. We had coffee and breakfast out there most mornings and enjoyed reading/relaxing there in the evenings. My niece even fell asleep on the daybed after a wonderful day on the beach. :) The pictures accurately depict the home and the elevator made loading/unloading all of the luggage/groceries so easy. Of note, the elevator opens into the bedrooms on the 2nd and 3rd floor ;). The screened in room on the 1st floor was fantastic for storing our floats/tents/chairs and hanging our towels/hats/coverups for use the next day. The walk to the beach was easy since the paved sidewalk leads from the door of the first floor to the dune walk over. We enjoyed a bonfire on the beach and saw a sea turtle and dolphins. We also walked to ConeHeads for Ice Cream. It was a wonderful vacation and an excellent place to stay. We would definitely stay again. Beautiful home with a great view! The Sanctuary is in a great location, in addition to being a beautiful home. It was very clean and when something came up, Mary and Michelle were very attentive fixed the problem quickly. The cabana on the first floor is a life saver! Thank you for being such a great family to host. We hope that you consider us for your vacation next year. This rental has so many nice extras that make you feel right at home. The elevator is so helpful for unpacking and packing. Just send all your bags right up and down it. The Cabana is a huge bonus. All of our outdoor gear felt so much more secure being kept inside it. Plus there are plenty of beach chairs, sand toys, boogie boards, and a wagon for your use. We wish we hadn't brought our own stuff. The pool is so close that it felt like our own private pool. The walk to the beach is very manageable even with kids, wagons, umbrellas or whatever else you are toting back-n-forth. It's not a bad walk at all. It basically felt like one of the beach front units because everyone has to use the boardwalk anyway to get onto the beach. The views from the decks and living room windows make you feel like you are right on the sand. The hammocks are super relaxing and a bonus to have when you just need some down time. The kitchen is fully stocked. We used both coffee makers and the croc pot. What a surprise to find things like soap and salt n pepper already there for us. The home owner is very accommodating and makes you feel like her personal guest. She is easy to contact and responds quickly. Thank you for making your place available for others to enjoy. Thank you Jennifer for taking the time to review our townhouse The Sanctuary At Seacliffs on Cape San Blas. We really enjoyed having your family as guests and very much look forward to your return. When you stay at our property YOU ARE OUR PERSONAL GUESTS!! 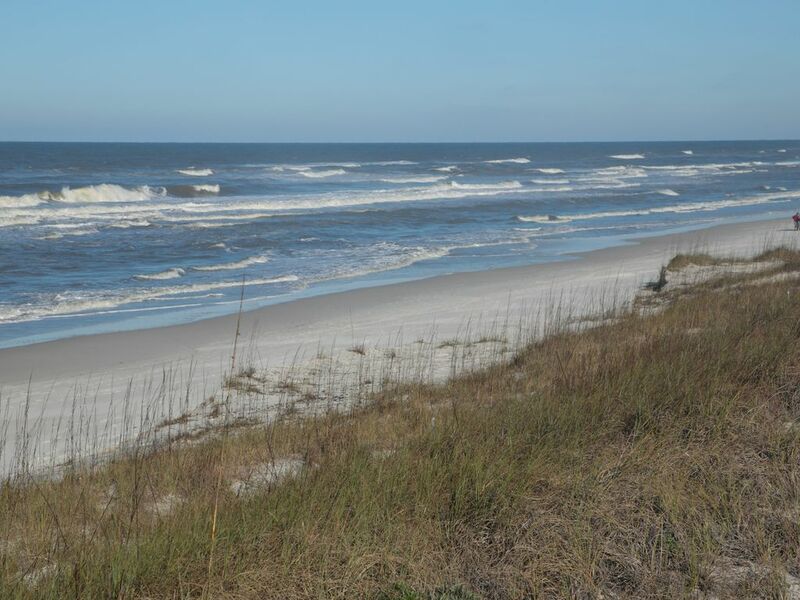 The Cape San Blas area is known for it's unbelievable natural beauty and unspoiled beaches. Groups gather on the beaches to photograph or view the sunset each evening. We are near the St. Joseph Penninsula State Park which has hiking/biking trails.. Restaurants vary from casual to more formal serving fresh Florida seafood.